Lawmakers threw out May's Brexit deal two weeks ago and will debate and vote Tuesday on competing plans for what to do next. Britain is scheduled to leave the EU on March 29, with or without a deal. Chief executives of fast-food company McDonald's and supermarket chains Sainsbury's and Waitrose were among signatories to a letter to lawmakers warning of "significant disruption" if the U.K. leaves without a deal, given that nearly a third of Britain's food comes from the EU. "While we have been working closely with our suppliers on contingency plans it is not possible to mitigate all the risks to our supply chains," said the retailers, who urged lawmakers to avoid a no-deal departure. "We anticipate significant risks to maintaining the choice, quality and durability of food that our customers have come to expect in our stores," they added. May says she wants a deal, and insists her agreement can still win Parliament's backing, if it is tweaked to alleviate concerns about a provision over the Irish border. The government hopes to bring the deal back for a new vote in Parliament in February. The border measure, known as the backstop, would keep the U.K. in a customs union with the EU in order to remove the need for checks along the frontier between the U.K.'s Northern Ireland and EU member Ireland after Britain leaves the bloc. Opposition to the backstop by pro-Brexit lawmakers — who fear it will trap Britain in regulatory lockstep with the EU — helped sink May's deal on Jan. 15, when Parliament rejected it by 432 votes to 202. A new proposal submitted by Conservative legislator Graham Brady commits to backing May's deal if the backstop is replaced by "alternative arrangements." Brady said if the motion was approved by Parliament, it would give May "enormous firepower" to go back to Brussels and renegotiate the Brexit divorce deal. The prime minister appeared to agree, urging Conservative lawmakers to back Brady's amendment in order to send a clear message to the EU. She made the comments at a meeting with backbench Conservatives, according to several attendees. But leading pro-Brexit Conservative Jacob Rees-Mogg said he and his "hard Brexit"-backing allies would not support Brady's motion because "it doesn't say what (the backstop) would be replaced with." "This withdrawal agreement has been agreed with the U.K. government, it is endorsed by leaders and is not open for renegotiation," EU spokesman Margaritis Schinas said. Irish Foreign Minister Simon Coveney said Sunday that Northern Ireland's peace process depended on avoiding the return of a hard border. "The EU has been clear that the backstop is an integral part of the withdrawal agreement," he said. Brady's backstop proposal is one of more than a dozen amendments proposed by U.K. lawmakers that aim to alter the course of Britain's departure. Some others seek to rule out a no-deal Brexit so Britain can't tumble out of the bloc on March 29 without an agreement in place to cushion the shock. 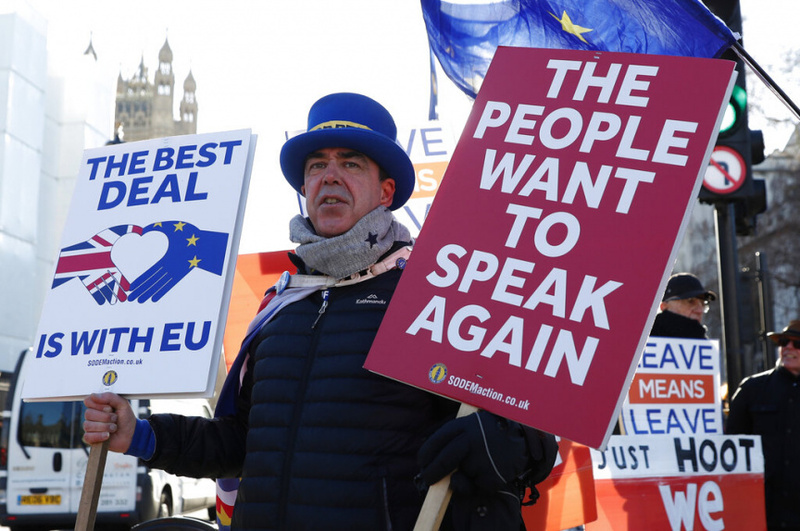 Conservative lawmaker Nick Boles, who is backing an amendment designed to rule out a no-deal Brexit and seek a delay to Britain's EU departure, said that Tuesday "is probably the only opportunity that Parliament is going to have to intervene in this process, to take control." "If we don't seize the moment tomorrow afternoon, then we are at grave risk of just driving off the edge on March 29 without really wanting to and when there might be a compromise we could achieve, if we just had a few more months," he told the BBC.